We have established Hurtigruten Foundation to ensure that our guests of tomorrow can enjoy the same unique experiences as our guests of today. Imagine – a world without polar bears. A world where pristine beaches are littered with garbage. A world where there is more plastic than fish in the ocean. Where the big corporations exploit the local communities they rely on. We can’t. And we won’t accept these possibilities. 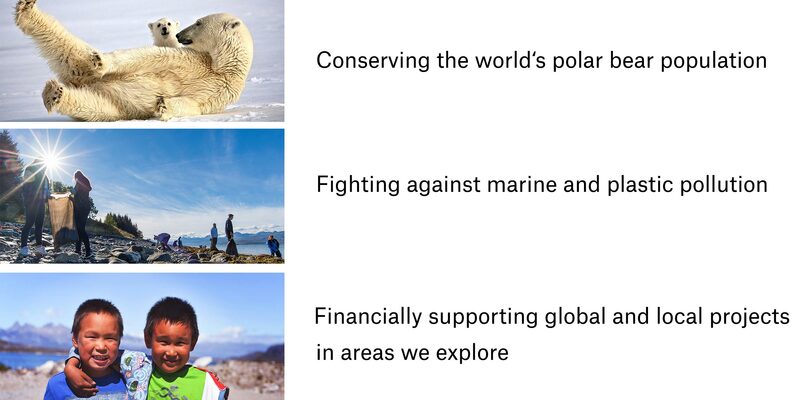 That’s why we established Hurtigruten Foundation. Working closely with guests, partners and organizations, Hurtigruten believes we can make a difference – by minimizing our operational impact and maximizing the positive contribution we make to local communities. In addition, Hurtigruten Foundation spans activities onboard and ashore, such as beach clean-ups, citizen science, water sampling, oil spill monitoring, and other science related projects. We educate guests and create ‘ambassadors’ for every destination on every voyage. Through lectures, discussions and other engaging activities, Hurtigruten Foundation is a platform for guests and crew to take a stance, volunteer in worthwhile causes, and make a genuine difference – together. Hurtigruten Foundation is funded by direct donations and several onboard initiatives, including auctions, fund-raisers, and the “Green stay” program, where a donation is made for every night you ask us not to clean your cabin, thereby saving energy, power, detergent and water. With minimal administration costs, all surplus funds from Hurtigruten Foundation are donated to selected organizations and causes – that all makes that special difference. Twice a year, the board of Hurtigruten Foundation will grant funds to initiatives in the areas Hurtigruten operate. The deadline for applications for funding is November 1st and May 1st. Being World leader in exploration travel comes with a responsibility we take seriously. Through our common admiration and love for oceans, wildlife, local communities and the pristine destinations we explore, we invite you to join us and leave a footprint we can be proud of – through Hurtigruten Foundation.